The “DEATH of the HUNT CAMP” article in The Landowner, October/November 2017, caught the attention of many, self included. Was the sky really falling? Following is what I have been able to ascertain. Warning; there are more questions than answers. Don’t expect a humourous result; yet! First – a word of explanation. When studying Shakespeare’s humour plays I didn’t get it. Where was the laughter? Except for Wayne and Shuster’s classic “Rinse the Blood off My Toga!” which appeared on Ed Sullivan, I saw no humour. My teacher explained that humour simply means that the story ends well. Really? Over the course of time I contacted the Ministry of Natural Resources and Forestry (MNRF), the Municipal Property Assessment Corporation (MPAC), hunt camp owner Evans McNab and the Municipality of Mississippi Mills (MM). Plus a couple of MPPs for comment. McNab told me that of the four municipal employees involved in the initiation of this issue, three are no longer in the picture. When I asked of their whereabouts for comment I received no reply. Only Dan Prest, Chief Building Inspector, was courteous enough to respond. He said that the municipality is responsible to administer or enforce, without prejudice, the Ontario Building Code, MM’s Building By-Laws, Zoning or any other regulation. Both the MNRF and MPAC promptly replied to my queries. 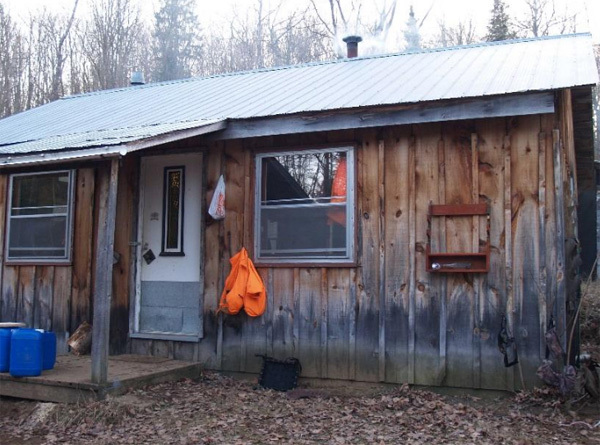 Example of one of the many hunt camps in Ontario. According to McNab, someone allegedly complained to MM that a neighbour of McNab had a hunt camp. As a result, MM discovered McNab’s hunt camp built in 2007 without a building permit and proclaimed, according to McNab, that “we will actively look for hunt camps with no building permits.” MPP Jack MacLaren told MM “to back off” at a meeting with their mayor and the by-law enforcement officer in the summer 2016 but “I don’t think they listened to me.” MacLaren believes that the intense public outcry against the municipality is rattling MM into backing off. McNab said that MacLaren pointed out that hunt camps are part of our cultural heritage and a way of life in the Ottawa Valley. Then, according to McNab, MPAC sent him a valuation assessment of $497,000 for the hunt camp and subsequently MM sent him a tax bill for $7000. All based, according to McNab, upon “fraudulent information” provided by MM to MPAC claiming that the hunt camp was 3000 square feet when, in fact, McNab states it is 1500 sq. ft.
For Current Value Assessment, MPAC analyzes sales of comparable properties in the area. What might that property reasonably be expected to sell for, in its current condition, on the open market? “We consider the location, living area, age of property, lot dimensions and quality of construction in our assessment.” MPAC states that accurate data is necessary. It uses land title documents, building permits, discussions and correspondence with property owners, on-site inspections, satellite digital imagery and questionnaires. If you are not happy with your assessment. MPAC has a free appeal option; followed by an appeal with the Assessment Review Board – “an independent adjudicative tribunal”. The Customer Contact Centre can be reached at 1.866.296.6722 or aboutmyproperty.ca. MM claims that the hunt camp is used as a second residence. “No,” responds McNab. “It is our family hunt camp; we have 4 owners and our 3 families use it.” He adds that MM By-law 11-83 clearly defines a hunt camp as a non-residential use, “but we still get taxed at a residential rate.” McNab believes all hunt camps need to be on guard against these actions by a municipality. MPP Todd Smith wrote: “I would suggest that it is an over eager CBO. There have been many complaints about the overreaching Conservation Authority in Mississippi Mills and perhaps the same type of thinking has permeated into the municipality.” It is not clear why it took MM so long to discover the McNab camp. So, how does that work? According to MPAC’s Andrew Loney, MPAC mails the Property Assessment Notice to the Province and the Province makes the Payment-in-Lieu of taxes to the municipality. The Province recoups the Payment-in-Lieu from the tenant for the portion of land leased which is payment for services provided by the municipality. McNab’s most recent tax bill is $8,135.52.